Rock lobster goes by a variety of names in Victoria, including crayfish or simply crays. Their official name is Southern Rock Lobster. They're big, local and absolutely delicious. Diving for rock lobster is awesome fun; however it's a skill that requires practice and patience in order to see continuous cusses. Rock lobsters are crustaceans which like to feed on shellfish, crabs, small fish and anything else they can get their claws on. They tend to live in rocky reefs less than 5 metres from the surface, with cracks and holes to hide in. Costal locations with these kinds of reefs are your best bet for rock lobster. Cape Schanck on the Mornington Peninsula is a good option for those who live in the Melbourne metro area. In Eastern Victoria, the coastline from Cape Patterson to Inverloch offers good lobster habitat. In the west, the coast near Warrnambool is a good option too. It's important to remember that rock lobster cannot be taken from the intertidal zone in Port Phillip Bay. In Victoria, you need a fishing licence (unless you're exempt) to legally dive for rock lobster. Licences can be purchased online. There are a number of important regulations to be aware of when it comes to diving for rock lobster. You can only catch and keep male rock lobsters with a carapace length of 11cm or more, and females need to have a 10.5cm or greater carapace. The carapace is the front edge of the groove between the large antennae to the nearest part of the rear edge of the carapace (main body shell). 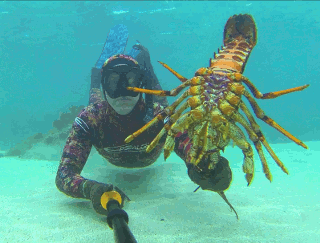 Divers are required to measure rock lobster underwater prior to placing them in their catch bag. We produce special measuring devices to help you with this. Call our Customer Service Centre on 136 186 to get one for free. Rock lobsters have a bag limit of two, meaning you can't take more than two crustaceans on any one day. The possession limit while in, on or next to Victorian waters is four. Caught rock lobsters need to be kept whole, or still have the tail and carapace attached to each other. You also need to tag them, which you can read about here. 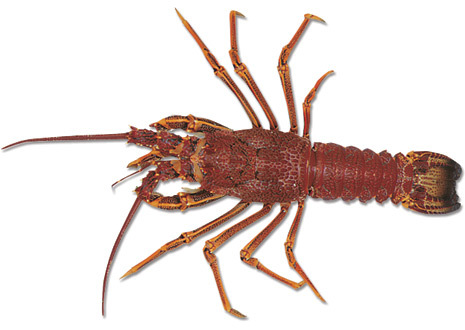 All rock lobsters taken by recreational fishers are to be tail-clipped or tail-punched with a hole at least 10mm in diameter. This requirement is time sensitive, and needs to be done within 5 minutes of bringing the catch onto a boat, or if taken from the shore, within 5 minutes of landing and within 50 metres of the place of landing. Rock lobsters also have closed seasons. From 1 June to 15 November, female rock lobsters are unable to be caught, and males can't be taken between 15 September and 15 November. It's important you stick to the rules otherwise you risk getting a fine or infringement. Click here for more information on the regulations. The only equipment you're allowed to use to take rock lobster in Victoria is an underwater breathing apparatus to assist with diving and recreational hoop nets when fishing from the shore or a boat. You can't use snares, gaffs, probes, rods, hooks, nets (other than hoop nets), baited equipment or any other piece of equipment to take rock lobster. Fisheries Officers regularly engage in underwater diving operations to check fishers are doing the right thing. Our rock lobster FAQs discusses what equipment and materials you can and can't use to catch rock lobster. Despite having such tough shells, rock lobster are actually pretty easily damaged. They have little chance of survival if you break their legs or antennae off, so only try for crustaceans you're certain will be legal. If it turns out the one you've got isn't legal, put it back where you found it. You can't take soft-shelled rock lobster. They've just shed their shells and are particularly vulnerable, so are protected until their exoskeleton hardens. They're usually pretty easy to spot, and are often sitting out in the open and look a bit clueless! You also can't take or possess female rock lobsters with eggs, or remove their eggs. Generally, rock lobsters sitting with their tails curled under them are in berry (carrying eggs), and should be left alone.